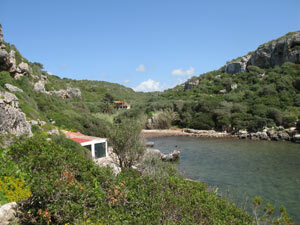 Walk from Cala En Porter to Cala Coves. These walks are not difficult [except for the one marked with a '*'] although the pathways can be uneven and rocky in places. Starting at 'Calle de sant Domenec' head east along the very well marked path. After 300-400 meters you join a much broader path where you can either take the southerly route to the headland overlooking Calas Coves. or head north along the longer route which takes you down into the Barranc and up along the Barranc side and into Calas Coves. Cliff walk overlooking Calas coves. It should take you around 1 hour return with the occasional stop for photography and a drink for this walk to the headland overlooking Calas coves. [*Note there is a very steep path zigzagging it's way down to Calas Coves, route on the map], so a departure into the cove is possible. The walk down into Calas Coves should take less than an hour each way. The pathway, although unmarked is easy to follow and is not over taxing. 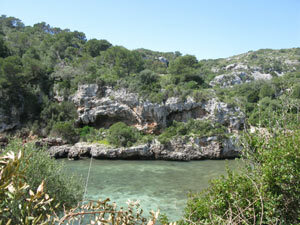 There is a good viewing point as you get near Calas Coves , marked on the map. Calas Coves is one of the most important archeological remains it's a Necropolis, comprising a group of caves, artificially excavated in the cliffs surrounding the Cala. 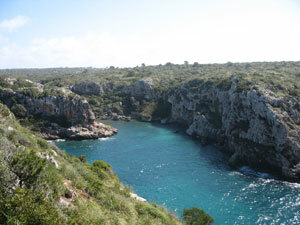 The Cami de Cavalls Cala'n Porter <-> Calas Coves starts at the end of Carrer D'Alt near the football ground. The trackway is fully cleared and marked and should take no more than thirty minutes to reach Calas coves. 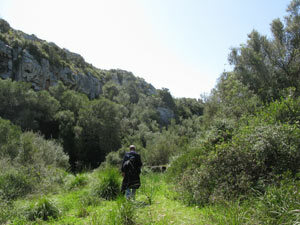 The Cami de Cavalls route to Son Bou can be found here. You can take a different route when you have climbed out of the Barranc which takes you back into Calan Porter instead of visiting Calas Coves, details on the map. Good walking shoes, sun hat, sun cream, a large bottle of water and, if going into Calas Coves, as the round trip including a rest and swim in the Cala can be up to 3 hours, a picnic and towel. 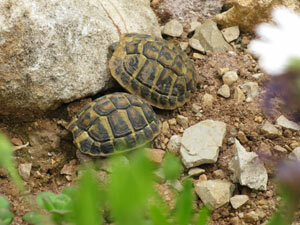 Watch out for the wild life. Calas Coves taken from the headland. 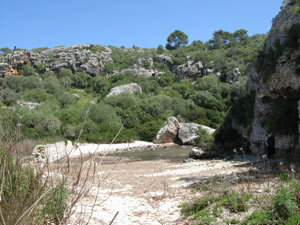 One of two beaches in calas Coves.